Would You Like a Side of Fava Beans with That? I’ve always said if I died in my house and wasn’t discovered for a while Riggins would eat me. That freaks people out but I’m okay with it. After all, I’ll be dead. Recently a couple of my visiting dogs have decided that I’m delicious and will lick me nonstop. I realized it was due to the coconut oil that I put on as moisturizer after showering. Apparently this entire time I’ve been basting myself for the big feast and didn’t even realize it! Right now I have four dogs in my house. The ever adorable Riggins, the brother and sister team of Jax and Bear, and finally my daycare darling Asscher. 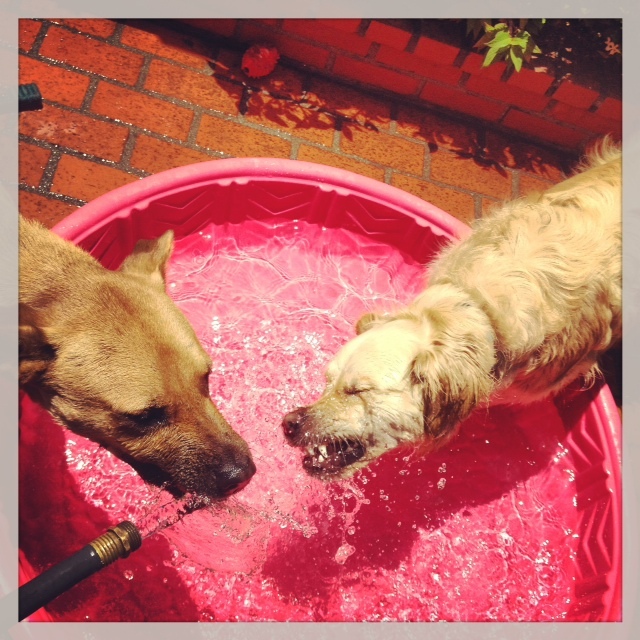 Jax and Asscher have become BFFs and consider themselves the lord and lady of the wading pool. These are two happy water dogs! Riggins has never liked water. He won’t even go near the bathroom unless forced to on his death march to get a bath. The fact that I willingly get in the shower and/or tub everyday simply blows his mind! 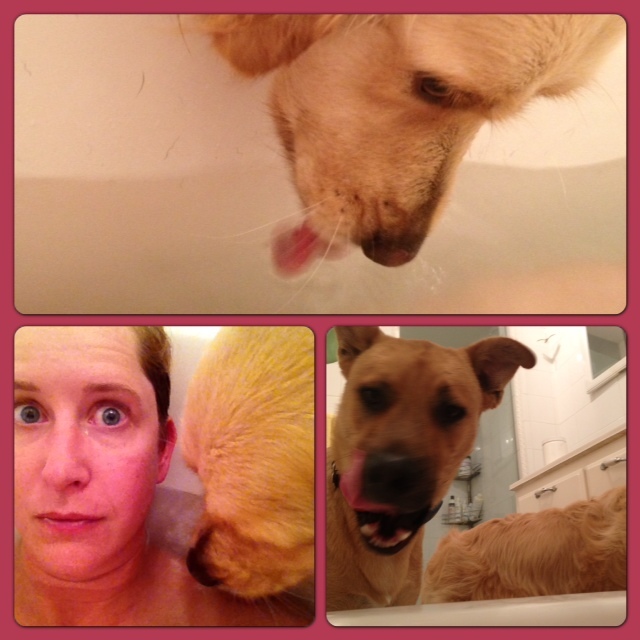 Today, after two different outings to two different dog parks, I realized I was filthy and badly needed to wash up. I was feeling a bit tired and achy so choose to take a nice relaxing bath. I ran the water, tossed in a dash of epsom salts and a splash of coconut oil (you can see where this is going already can’t you). As I happily slipped into my tub ready to read a few chapters of The Game of Thrones my bath took a turn for the Psycho. The dynamic water duo came bounding into the bathroom (not thinking there would be a problem I hadn’t closed the door) and immediately stuck their heads into the tub. Asscher was the worse. She would not leave the side of the tub. In trying to make her stop drinking directly from the dirty tub water I would push her away only to have her realize I was even tastier than what was in the tub! The two of them, with Asscher as the lead, proceeded to try to lick as much as me as they could. I tried to sink deeper in the water but then my legs had to pop out … so I pushed them in and my arms had to come out … I couldn’t submerge enough. Imagine you were Queen of the Nile and being bathed by your faithful servants except your servants were dogs and their bathing instruments were their tongues. 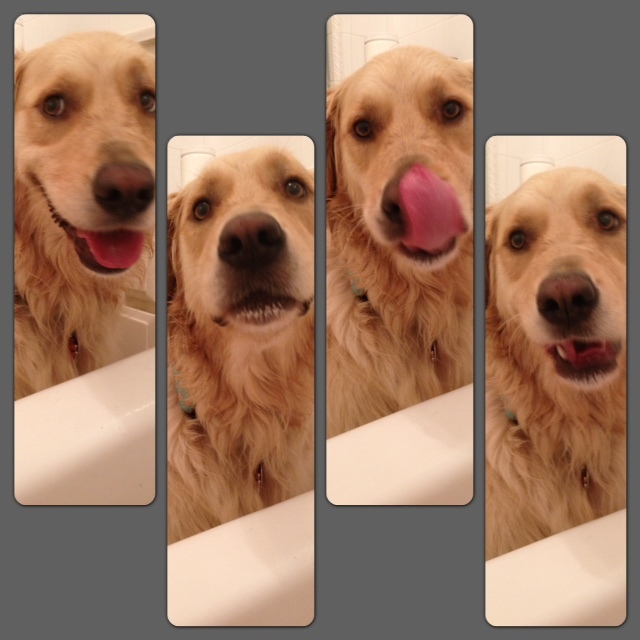 I had no choice but to ditch the bath and hop into the shower to wash off the slobber that I was now drenched in. Asscher and Jax waited, not so patiently, just outside the glass shower door ready to resume licking as soon as they could. As I toweled off and quickly grabbed my clothes I noticed King Riggins was happily lounging on my bed with Queen Bear on the floor beneath him. Neither even raised their head as I ran into the room in search of clothing with my faithful followers at my heels. I realize you are pretty grossed out by this entire post. Believe me I am too. I may have to take another shower after writing about the incident. Right now Asscher is wandering around the house belching. Apparently salty, coconut flavored, warm water makes you a bit bloated. Hey dogs have some marinated Wendy!